Quiet Spot is all about the views. Looking west across Linekin Bay to Spruce Point, the sunsets are simply spectacular. Osprey, loons, eider ducks, heron, eagles and seals are all frequent visitors to this beautiful stretch of water. The craggy rocks and seaweed can be seen at low tide with the water coming right up to the pines during high tide. Sail boats, schooners and ketches, lobster boats, yachts and wind surfers all pass by throughout the day. The views are stunning and you will love them from sun-up to sun-down and even after the moon and stars are up! East Boothbay makes a wonderful home-base for vacationers to the Boothbay area. Be sure to explore this beautiful part of the peninsula with walking trails that are part of the Boothbay Region Land Trust. Have local guides take you on sea-kayak adventures and see coastal Maine from an entirely different angle. Head into Boothbay Harbor for boating excursions, whale and puffin watches, sunset and reggae cruises and sailing trips. Head over to Grimes Cove for salt water swimming or to Knickerbocker for a fresh water dip! Rent bikes or mopeds and ride along the coast from East Boothbay out to Southport Island or around Barter’s Island. Or, simply move from your open deck to the screened porch for the balance of sun and breeze that works for you! Quiet Spot is a classic, old Maine waterfront cottage built right on the ledge over Linekin Bay with beautiful 180 degree westerly views. With open studded walls and a charm all its own, this summer cottage exemplifies New England seacoast living. While the living room has a beach stone fireplace to enjoy the indoors, the sunny screen & glass porch and breakfast room both look out over the glistening water of Linekin Bay. The kitchen is tidy and fully equipped with plenty of room for you to unpack and settle in. The open deck is set up for alfresco dining with one of the most gorgeous views you can imagine. Two bedrooms (one with a Queen Bed and one with Two Single Beds) as well as a ¾ (tub) bathroom round out the Main Floor. The lower level is accessed by going outside. There is another bedroom with Two Double Beds, a sitting area and sliders leading to the small grassy lawn and more of those incredible views. This level also has the ¾ (shower) bathroom. This cottage is a one story cottage with this basement room which sits just a few feet from the edge of the sea. No matter what, there will be days when this area will feel like you are on a boat. You will experience a bit of dampness from time to time, especially with the fog and the morning dew. Be sure to let us help you create the perfect vacation! We love this sweet little cottage and have all kinds of ideas and information on how you can enjoy your vacation at Duck Inn. Reach out to us for help in planning your trip! Cottage Connection was one of the first vacation rental companies in the Mid-coast region of Maine. Jeff and Audrey Miller, who own three vacation rental homes themselves had an aha moment when they realized they could not find anyone who ‘got it’ to manager their rentals for them. Since 1993 they have been trusted by homeowners and vacationers to “connect” each family with the perfect cottage for their vacation. As Audrey puts it; “The home they stay in becomes a personality, a part of their lore when a family connects with the right cottage. Whether they want a rustic cabin in the woods or a high-end ocean bungalow, the right setting sets the tone for the entire vacation.” Learn more about how Cottage Connection can help make your vacation perfect! The Boothbay Peninsula is a beautiful region rich in culture, history, all things nautical and of course it’s own unique niche in nature. The area offers ample opportunities for biking, kayaking, canoeing, fishing, charters and guided cruises, spas, golf, mini-golf, bowling, museums, antiquing, hiking and walking trails. We have the Maine State Aquarium, the Coastal Maine Botanical Gardens and the Boothbay Region Land Trust with its 30+ miles of pet friendly trails in protected areas. For a more comprehensive list of local offerings Click Here! East Boothbay is an area that stretches from Boothbay Harbor out to Ocean Point. There are several little communities that are part of East Boothbay. Rich in boat building history, East Boothbay in renowned the world over for the ship yards of the region. With many seasonal cottages and homes, there are a few brave souls who call East Boothbay home year-round! Restaurants include Lobsterman’s Wharf, Ocean Point Inn and East Boothbay General Store. A full service Marina is located behind the Post Office. Great walking trails and of course incredible ocean views abound in this unique part of the Boothbay Peninsula. Beautiful view of Linekin Bay; quiet and peaceful. We have enjoyed 14 years of great history with the staff of Cottage Connection! They are great people to work with. Quiet Spot lives up to its name, we so enjoy the Quiet! The new windows on the porch were a very pleasant surprise. It was a wonderful and welcome surprise to arrive at Quiet Spot to find our beds made with clean sheets and fresh towels waiting for us, all by way of thanks, as we understand it, and in commemoration of two decades of good service to renters like us. In this age when transactions are just that and no more, to be treated so well and thoughtfully when you didn't have too, well...what a wonderful treat. THANK YOU! And the family CBMO (Chief Bed Making Officer) sends her special thank. While I was sorting out the kitchen (my job), instead of tucking in sheets, she was already settling into full vacation mode. Cottage Connection has made our annual journey easy and carefree, especially so this year. Each member of the staff has always been unfailing courteous and helpful. We look forward to returning for many years to come. We have been coming to Quiet Spot for more than the past decade, missing only one or two years. It has always been a great pleasure to come here; besides being a quiet spot, it is also a splendid spot. Check-In Day: Thursdays, June 25 - August 31, 2017 (Prime Season Week’s). Bays are usually a recess in the coastline that opens directly into the ocean. In Quiet Spot's case, Linekin Bay empties into the Atlantic Ocean. 5 – very easy water access, sandy or pebble beach, great for all ages! 4 – Easy water access, may be a pebble beach or grassy shoreline. Still good for all ages, but young children may want water shoes. 3 – Somewhat easy water access with a rocky shoreline, or rocky bottom, not suitable for young children, but fine for older children/adults, water shoes recommended. 2 – Water access only for agile young adults or adults, rocky shoreline or bottom, may be a hill down to the water or subject to strong currents. 1 – Swimming off dock only due to a seawall or rocky/wooded shoreline, owner has provided a swim ladder to make getting in and out of water easier. 0 – not a waterfront property. 5 – very private, secluded location, lots of protection from trees, cannot see any neighbors from the house, not close to any roads, long driveway. 4 – Private location, protection from trees, neighbors a comfortable distance away, not close to any roads. 3 – Still in a quiet location, but one neighbor close by, little protection from trees, may be close to a road. 2 – Semi-quiet location, neighbors close by, may have road noise. 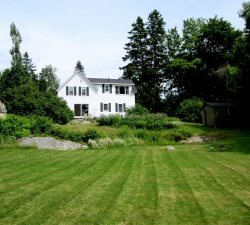 Cottage Connection of Maine represents a wide variety of quality vacation rentals throughout the Mid Coast Region of Maine. Individually and privately owned, each vacation rental reflects the taste of its property owners. Every effort has been made to ensure that the descriptions and amenities listed are accurate. However, occasionally changes are made by the owners to furnishings, amenities and equipment. Once a change that has occurred is brought to our attention, we will update that webpage. If you have any specific questions not addressed above or are in search of specific criteria, please contact us.